The Stone Railhead Crisis Group (SRCG) has drawn up plans for an alternative railhead to be constructed at land named Aldersey’s Rough, close to the villages of Madeley and Keele. HS2 Ltd announced plans for the railhead – which would serve as a compound for all railway systems and installation works – as part of a ‘design refinement’ to the route between Birmingham and Crewe. It would later become a permanent maintenance depot for HS2. think you need to qualify your statement about an existing connection. Presently, there is no connection from the M6, that will be built by HS2 Ltd if they site the Railhead at the proposed location. As you are a resident of Stone, may we ask why you think the Railhead is a good idea? The connection to the M6 is off Yarnfield Rd, an existing slip road used by emergency services and maintenance. Yes I believe the rail head will be good for Stone in the long run. I think you miss the point. That ‘existing connection’ is for emergency vehicles and highway maintenance ONLY. If the Railhead is located there, the existing connection will be removed (along with the Yarnfield Lane over bridge), which will be moved 25m north, and a NEW access to the Railhead will be created. With very minor modification this existing connection will allow construction vehicles able to use the M6 from the start of construction and the new link can be built along side. with Yarnfield North Embankment satellite compound these are just a few that HGVs will use a haul road to Stone railhead thereafter to the M6. The numbers you have used from the document (actually it’s section 9.5.5) have been taken out of context. If you wish to comment on this site, please check the facts beforehand. If you re-examine section 9.5.4, it states these are the figures of staff and HGV’s into the site AFTER the completion of the project in 2027, and then re-estimated for 2041. Please reread section 9.3.7 table “Table 276: Typical vehicle trip generation for construction sites in the Stone and Swynnerton area” All i have done is copy and pasted this section in my pervious comment so how can facts be wrong or out of context? As you can see the M6 is used for HGVs from 2021, now lets see what happens when phase 2a bill is passed. Stone… Change your name to HS2 !! Yarnfield lane is bought to a total standstill at present due to the slightest roadworks on Eccleshall road etc. What do you think it will be like when hundreds of 40tonne wagons are using it constantly until the motorways junctions and railhead are built. Min 3 years. The A34 will be a similar gridlocked zone. Stop believing the HS2 propaganda, and get a reality check.. This will destroy Stone area for years !! Now Neil, I could say change your name as well. You may not like it but things change. This project will NOT destroy Stone. 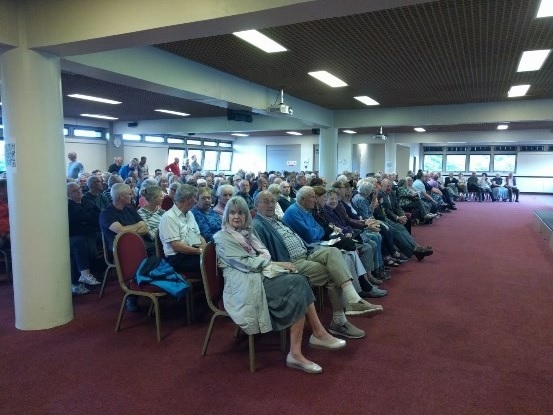 At the meeting last Tuesday the Town Council resolved to endorse the efforts of the SRCG and to join Swynnerton Parish Council in providing some tangible support. That is the authentic, democratic voice of Stone speaking rather than that of an individual who presumes to do so and who prefers to hide behind an alias. May I also push back on the comments of Anne regarding the High St. The Town Council accepts that Stone, like all market towns, faces challenges regarding town centre shops in the face of changing shopping habits, but the Town Council’s initiatives such as late-night shopping and events in the town centre are helping the High St to hold its own. High St occupancy rates are above the national average. So would you like to explain “tangible support” is this funding?, I have never said I talk to for the whole of stone, I am just an individual that believes that the location chosen is the best location as the railhead is built along side the M6. You cannot actually believe that the best reason to build the railhead in the proposed location is that it that it lies along the M6! So do many other places! Yes, I am being facetious but I also take issue with your comments that the initiatives taken will save Stone from the fate of other towns. As pleasant as these might be, it will take a great deal more to save Stone than that and I do believe that if the railhead goes ahead, it will contribute to Stone’s decline. Please also give some consideration to those who live in close proximity to this monstrous project and whose lives are now blighted by personal and financial worries. Thank you SRCG for all your efforts. Yes i do have consideration for those which will be blighted by the impact will still be low in my option due to its proposed location. Just how will this project contribute to stone decline?? ?